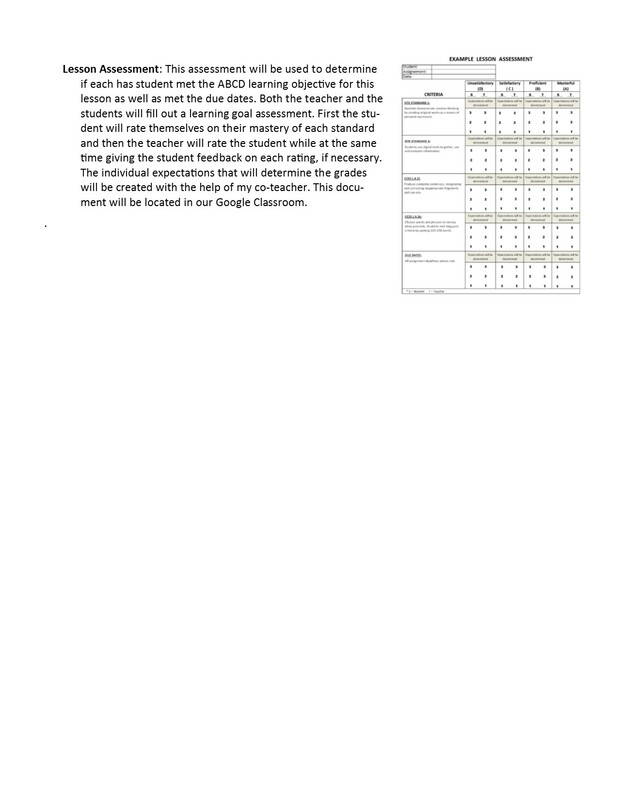 For my individual project, I developed a lesson plan for my 18-21 year old transition students. The purpose of this lesson is to teach my students to use different technologies as a means for creating interactive blog pages that document their internship experiences. This entry was posted in 2. Instruction, 4. Content Knowledge, 5. Learning Environment, 6. 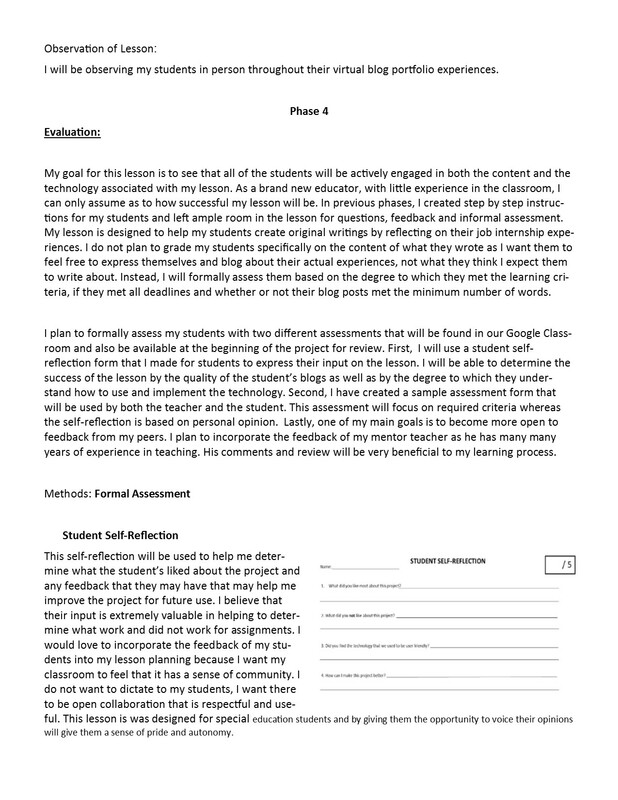 Assessment, EDCT 6431 and tagged Chromebook, EDCT 6431, effective teacher, Glog, Glogster, Google Classroom, Integrated Learning, ISTE 1, ISTE 3 on August 18, 2015 by Kathryn Wright bPortfolio. Question: How can school districts utilize the technological knowledge of Digital Native Students? In the article Digital Natives, Digital Immigrants, Marc Prensky’s (2001) wrote that our students today are, for the majority, “native speakers” of the digital language of computers, video games and the Internet. This got me to thinking. As many educators are from the pre-digital age and may not be as tech-savvy as our students, how can we utilize their technological knowledge to benefit our schools? In the article, School Districts to Use Kids to Help Troubleshoot Tech Issues, Dan Waters (2013) reports on a school district in Chicago that is utilizing its tech-savvy high school students by creating a group of high school students called iAgents. The iAgents were on hand, during the summer and the first week of school, to pass out and set up each of the student body’s iPads and Chromebooks for the coming school year. According to Water’s, the high schools had the iAgents manning a help desk in the library during students’ lunch periods to assist with any issues that would arise as well as the managing of online forums where kids could post questions about how to access class materials and lessons, among other topics. These iAgents are such a great example of students demonstrating a sound understanding of technological concepts, systems and operations. What I like most about what this school is doing is that it is creating a place for tech-savvy kids to become creative, helpful and needed. I know that a lot of my students have a hard time finding a place to fit in within our high school. I think that if we had a program that offered students the ability to work with technology and use the skills that they excel at, our students would find a sense of pride and accomplishment that they may not have felt before. I love that this program creates peer interaction between students and encourages teamwork. This entry was posted in 4. Content Knowledge, 5. 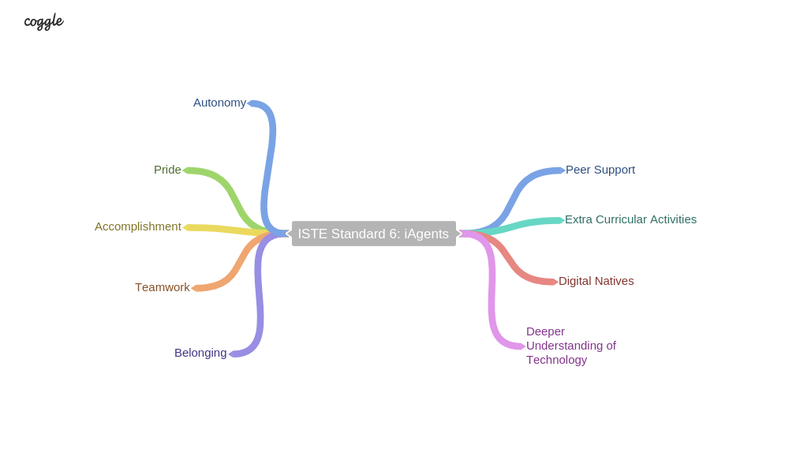 Learning Environment, EDCT 6431 and tagged EDCT 6431, iAgents, ISTE 6, ISTE Standards, Technology for the Classroom on August 16, 2015 by Kathryn Wright bPortfolio. ISTE Standard 5: Where can students turn when they are being Cyberbullied?? Question: When advocating for positive digital citizenship, what safeguards can schools take to help protect their students from cyberbullying? Technology gives student’s anonymity and with being anonymous comes bravery. The previous ISTE standards have helped me to realize that technology can give shy students a voice; that they become more brave and autonomous when communicating online. This can be such a great feature but at the same time, it can give people the feeling of superiority and authority. According to Common Sense Education (2015), ‘students learn that cruelty can escalate quickly online because people are often anonymous and posts spread quickly.’ Cyberbullying has been in the headlines a lot of late. School aged suicides are becoming more and more common. There were 2 suicides related to the school I work at, just last year. It is our job as educators to teach positive digital citizenship and to also make sure that students have somewhere to turn when they need help. This article if full of great information that can benefit all school districts! It teaches schools how to set up a Google Voice account that allows students to call or text when they feel that they, or someone else, is being [cyber] bullied or is in danger. Hinduja (2015) wrote, ‘we strongly believe that every school should have a system in place that allows students who experience or observe bullying or cyberbullying (or any inappropriate behavior) to report it in as confidential a manner as possible. It seems obvious that we should be using mediums that youth already prefer. In addition, being able to broach the subject without being forced to reveal one’s identity or do it face-to-face may prove valuable in alerting faculty and staff to harmful student experiences, and help promote an informed response to bring positive change.’ Schools are encouraged to hang posters, send out flyers, and use their automated school wide messaging system to make sure students know the Google Voice phone number. It is also important to make sure that students know that they can call anonymously for any reason and at any time, day or night. This entry was posted in 5. Learning Environment, 7. Families and Community, 8. Professional Practice, EDCT 6431 and tagged Cyberbully, EDCT 6431, Google Voice, ISTE 5, ISTE Standards, Social Media, Technology for the Classroom on August 9, 2015 by Kathryn Wright bPortfolio. Students are able to plan and conduct research, manage projects, solve problems, and make decisions using digital tools and resources. Question: What online tools can teachers use to help students research, create and manage innovative project presentations? In this article, Jamie Renton writes about Glogster.com and how students can use this website (and app!!) to analyze and organize information and then create interactive virtual project presentations. Renton highlights 3 main benefits to this program. Firstly, Glogster increases digital literacy by using technology tools to organize and display knowledge and understanding. Additionally, Glogster enables schools to meet and educational technology and content area standards for creativity and innovation, communication and collaboration, research and information fluency, critical thinking, problem solving and decision making, and digital citizenship. Another benefit of Glogster is it gives diverse learners options for acquiring information and knowledge which facilitates problem solving and critical thinking skills. According to Kuo, Chen and Hwang (2014), research has proven that students’ high-order thinking ability, such as problem-solving, and critical thinking ability, could be effectively improved by means of searching for web-based resource. Glogster gives students the opportunity to compile the information that they have collected, organize it and present it. This application is a great tool for creating interactive poster presentations on different research and interest topics. I like that students are able to collect data, images and videos and then pick and choose what information they add to their Glog. The downside of Glogster is it is not free and requires a yearly registration fee of approximately $95 per year. This entry was posted in 2. Instruction, 4. Content Knowledge, 5. Learning Environment, EDCT 6431 and tagged Chromebook, EDCT 6431, Glog, Glogster, ISTE 4, ISTE Standards on August 2, 2015 by Kathryn Wright bPortfolio. Question: How can the use of a digital learning environment be used to create personalized, interactive and engaging learning? I love the idea of incorporating technology into the classroom. My positive experience with the Google Classroom has helped me to become comfortable with the idea of integrating online classrooms into our traditional classroom. I have found that students are more open to contributing ideas to online discussions, use additional creativity to formulate and execute their ideas and projects, and show an excitement for online learning. According to Peter Cookson Jr., a principal researcher for Education Sector, ‘Technology for instruction, if done well, allows students to reach out to a much broader world. Students today are comfortable with turning on a computer for learning. It’s not novel or unusual for them. The challenge is to use the technology creatively to meet learning goals” (Wong, 2014). Cookson makes an excellent point. Students today are tech-savvy. They have iPhones and tablets that they bring to school each day. It only makes sense to utilize the technology they are already using to enhance their education. Wylie Wong wrote, “Admittedly, new technology helps meet Common Core State Standards and online standardized testing requirements. But educators say their ultimate goal is to prepare students for success by helping them develop modern skills” (Wong, 2014). The new Classroom in a Box goes beyond the integrated idea of the Google classroom. In the ‘box’ are all of the components needed to convert classrooms into one-to-one learning environments. The package includes 30 devices — either Galaxy Tab 4 Education tablets or Chromebook 2 notebooks — along with professional development solutions, and subscriptions and licenses for curriculums. Samsung partnered with McGraw-Hill to bulk up on digital curriculum offerings. The textbook publisher will provide 30 one-year subscriptions to its Thrive digital curriculum, which covers Common Core State Standards for English Language Arts (ELA) and math for grades 3-8 (Smith, 2015). This is a great opportunity for teachers to try out the program for a year before their district makes a financial commitment. The idea behind this technology is to integrate online classrooms into the traditional classroom thus creating a personalized, interactive and engaging learning experience. This entry was posted in 2. Instruction, 5. 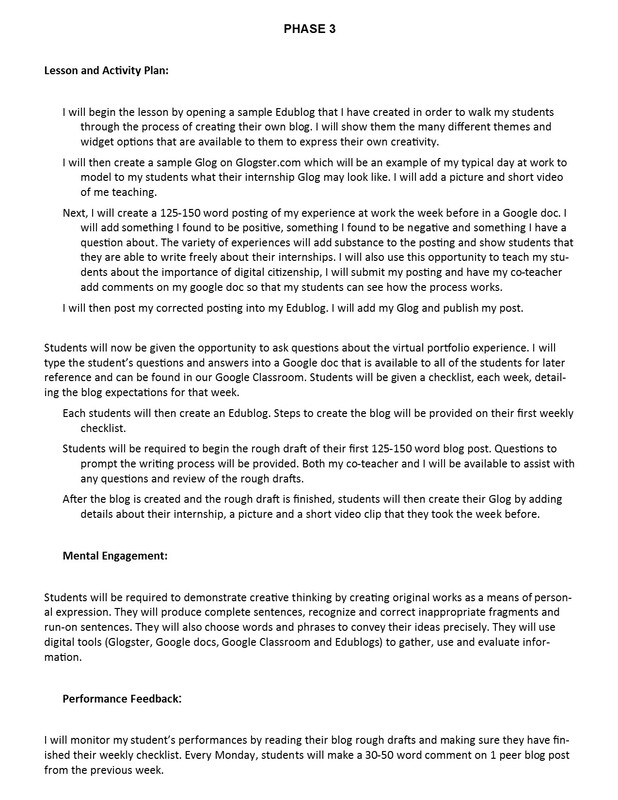 Learning Environment, EDCT 6431 and tagged Chromebook, Classroom in a Box, EDCT 6431, Integrated Learning, ISTE 3, ISTE Standards on July 26, 2015 by Kathryn Wright bPortfolio. Question: How can teachers use Twitter to facilitate discussion, relay information and create collaboration? The focus of the ISTE Standard 2 is to help facilitate the use of digital media in the classroom in an effort to create quality discussion and effective collaboration between teachers and students. According to the National Education Association, the social media phenomenon, Twitter, is being used by educators ‘to enrich their classrooms.’ Teachers are using Twitter to review previous lessons, remind students of future lessons and create discussion in 140 characters or fewer. Students are then able to post questions or comments which facilitates discussion and collaboration. One teacher claimed that he used Twitter to keep his students thinking after class had ended. Michelle Lampinen, a high school teacher, makes use of blogging by creating lessons that ‘address multiple Common Core standards, hold students accountable while minimizing stress, be structured enough to provide clarity while giving freedom to experiment, be varied enough to keep students engaged, and get students to write for multiple purposes.’ Assignments such as these can also be adapted for use on Twitter. Many school districts around the country are encouraging educators to use social media to enhance their classrooms. I love the idea of using Twitter as a mean for communication and collaboration within the classroom. I believe that by using social media, students who may be quiet or shy in the classroom, may find their voice among the message boards. 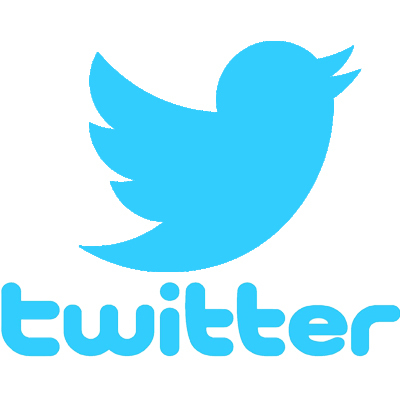 Many older students are already using Twitter as a means of communication, through posting their own tweets and following their friends. It seems like a natural progression to integrate this type communication into the classroom as it has the potential to engage students in learning by using a format that they already enjoy! This entry was posted in 2. Instruction, 5. 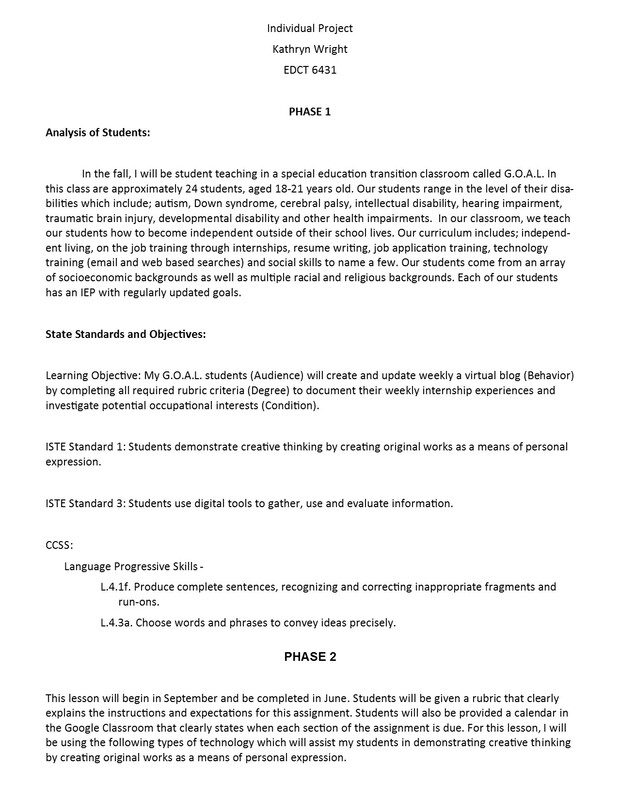 Learning Environment, EDCT 6431 and tagged EDCT 6431, ISTE Standard 2, ISTE Standards, Social Media, Twitter on July 19, 2015 by Kathryn Wright bPortfolio. Question: What are the benefits of combining a traditional face-to-face classroom with an online classroom in a special education classroom? This week, I have learned that the focus behind ISTE Standard 1 is to facilitate and inspire student learning and creativity through innovative thinking, the use of digital tools and resources, and partnering face-to-face and virtual environments. Technology is becoming more and more accessible in schools throughout our country. In accordance with ISTE Standa rd 1, the Google classroom is an innovative way to inspire student learning. Within the classroom, students can view their syllabus, create a calendar, complete assignments, work on journal entries, and collaborate with other Google products. Information can be shared instantaneously with the click of a button between students and teachers. According to Deaton et al. (2013), the application and purposeful use of software and hardware helps learners to manipulate and generate unique interpretations and to represent their knowledge flexibly and meaningfully. In turn, such approaches encourage students to become creative, critical thinkers, problem solvers, and effective users of technology. The potential for the Google classroom is vast. Students can create projects using applications such as iMovie and Prezi and link them to the classroom for their classmates to view. Over the course of the week, my mind has been filled with numerous different project ideas for my future students using these applications. Digital storytelling is a new concept to me and I find its application possibilities very exciting. I work in a special education classroom where we strive to help our students create internship portfolios. With the use of digital storytelling, I am now looking forward to apply this concept to virtual internship portfolios. Deaton, C. C. M., Deaton, B. E., Ivankovi, D., & Norris, F. A. (2013). Creating stop-motion videos with iPads to support student’ understanding of cell processes. Journal of Digital Learning in Teacher Education, 30(2), 67-73. This entry was posted in 4. Content Knowledge, EDCT 6431 and tagged EDCT 6431, Google Classroom, ISTE 1, ISTE Standards, Technology for the Classroom on July 12, 2015 by Kathryn Wright bPortfolio.